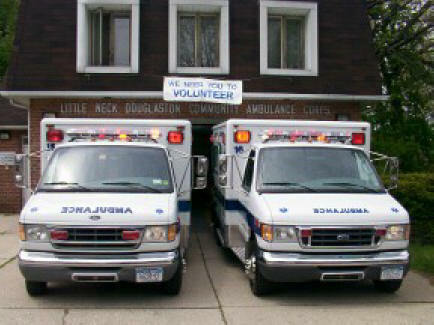 The Little Neck-Douglaston Community Ambulance Corps owns and operates two well-maintained, New York State Certified ambulances. Click on the ambulance you wish to learn about. Copyright � 2000-15 Little Neck-Douglaston Community Ambulance Corps, Inc. All rights reserved. Many thanks to Dan Hurley for the original creation of this site.